It’s a feeling most people will experience at least once in their lifetimes, though for some it will become a daily occurrence. People use different ways to describe it: heartburn, indigestion, and sour stomach are some of the most common. Regardless of what they call it, there’s universal agreement that it’s not fun. Those feelings are caused by stomach acid going up into the esophagus. While the stomach is designed to withstand the acid it creates to help digest your food, the esophagus is not. When you’re experiencing these symptoms, it’s called acid reflux. 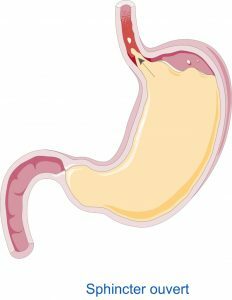 Overeating is not only uncomfortable for the belly, it can also predispose to those acid reflux symptoms that may have you reaching for an antacid. The best thing to do is listen to your body when it tells you that it’s full. It can take some time for this to occur, which is why savoring and slowly enjoying your meal is important. Remember, there’s no shame in getting a to-go container from your favorite restaurant or eating leftovers from the refrigerator. As the holidays approach, the temptation to overeat is even greater. There’s just so much yummy food out there that you only see at this time of the year! Remember, you can always wait a few hours before you go back for seconds. Also, consider freezing some of your favorite dishes so you can enjoy them in reasonable quantities throughout the year. Avoid the foods that cause symptoms for you (or pay the price). Many people know exactly which foods cause symptoms for them. Commonly cited foods include anything with tomato sauce (e.g., pizza or spaghetti), barbeque sauce, coffee, and alcohol. If this is your case, avoid these foods or know that if you eat them, you’ll get the symptoms later. Let gravity work in your favor. Simple physics says that if you eat your dinner and go to bed right afterward, just by lying down, you’re more likely to get acid reflux symptoms. Gravity works in your favor when you’re sitting up. It’s harder for reflux to occur against gravity! Try to separate your last meal of the day (including snacks) from bedtime by at least three hours. Consider smaller, more frequent meals instead of three meals a day. Smaller, more frequent meals have been cited as more healthful for several conditions, including helping with weight loss, better control of blood sugar in diabetes, and boosting your metabolism. Well, it may be helpful in acid reflux, too. Remember what we said above about overeating? You’re less likely to do that if you’re eating small, frequent meals, because you never get really, really hungry. This means you aren’t stretching your stomach to its capacity to hold all the food you’re giving it. Which means it’s less likely to send a little up the esophagus. Elevate the head of your bed six to ten inches. You don’t have to own a bed that does this for you with the touch of a button (although, if you do, this one is super easy!). You can do this by placing blocks under the head of your bed. Remember our good friend gravity from above? Well this helps utilize gravity even while you’re sleeping, because your stomach is lower than your head. If you don’t want to elevate the head of your entire bed, you can also achieve this by purchasing a wedge shaped pillow. This has been drilled into our heads to better control diabetes, decrease risk of heart disease, and may even help prevent cancer. Reducing acid reflux symptoms is one more reason to trade your nighttime couch routine for a gym routine. Yep, smoking triggers acid reflux symptoms. And we know it puts you at higher risk of several different cancers. When occasional heartburn turns into a daily (or nightly) ordeal, and you’ve changed up your lifestyle but nothing seems to help, then it’s time to talk to your doctor. Here at GastroIntestinal Healthcare, we specialize in treating these types of symptoms. We know that uncontrolled acid reflux can decrease quality of life and we’re here to help you get back on track.